No matter what type of chocolate you prefer, you must admit nothing compares to fine chocolates made from real cocoa, butter, and cream. Small batches are always best, with a variety of fillings to appeal to all palates. The following chocolate shops in Maine offer all this and more for those who dub themselves official “chocoholics.” Check one or more out the next time you’re in the Pine Tree State. Perkins Cove Candies is known for their fine handmade chocolates, with their chocolate covered sea salt caramels among their best sellers. Treat yourself while visiting the state’s southern coastline, and hand pick your own box. Made in small batches in-house, Divine Chocolate uses only the finest chocolate in every recipe. Whether it’s turtles, truffles, non-pareils or butter cream centers, you’ll find exactly what you’re taste buds desire at this shop. Wilbur’s of Maine Chocolate Confections makes even more of their handmade chocolates in-house than they used to. Replacing those made by others in favor of their own recipes, they use only the finest ingredients. They are best known for their signature line—Meltaway Truffles. For delicious homemade fudge, caramels, dipped chocolates and more, visit Specialty Sweets. Handcrafted in small batches, you’ll love the ever-changing offerings. 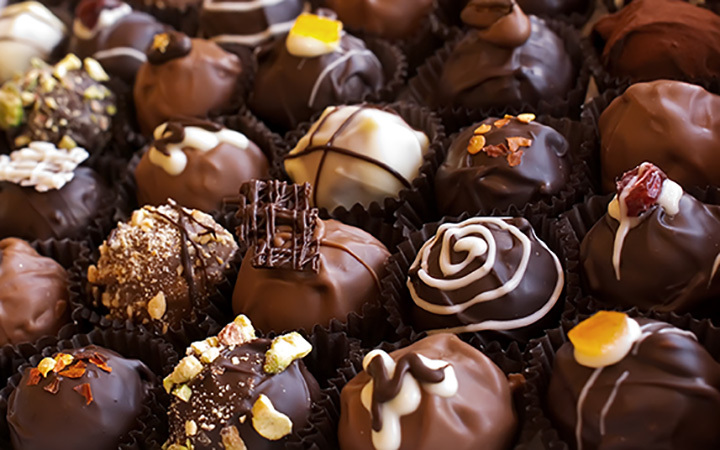 For a nice assortment of handmade Maine chocolates, visit Old Port Candy Company. You’ll find varieties made by all your local favorites. Be sure to check out the dark chocolate sea salt caramels and peanut butter cups! Len Libby Candies have long been a Maine tradition. Handmade, rich, and decadent, you’ll be hard pressed to find a better local chocolate. The soft center chocolates are divine, and the turtles run a close second. Family owned and operated, Kennebec Hand Dipped Chocolates has perfected chocolate delicacies including chocolate dipped blueberries. It doesn’t get any more “Maine” than that. Their gourmet truffles, chewy chocolates and hand dipped espresso beans are all to die for, too. Dean Bingham started making truffles as a side job, but soon realized he had a real talent. Operating his business since 2004, countless customers have enjoyed his many hand-crafted confections. He comes up with new flavors for truffles on a regular basis. Kate Shaffer first made chocolates in her home before opening Black Dinah Chocolatiers. Now she crafts them in her Westbrook business, and sells them in her tiny storefront. Don’t let tiny deter you. These chocolates pack a mighty punch! You’ll love the handmade chocolates in this tiny island store. Made in-house, they run the gamut from truffles and bark to caramels and nut clusters.